Lookout Valley players cheer on teammate Rylan Chandler. For most of this high school baseball season, Lookout Valley sophomore Nathan Hart took time away from the batting cage in order to go to school, eat and sleep. The rest of the time it was his residence. On Wednesday night, with a lively contingent on hand and a Region 2-A baseball title on the line, Hart finally got his chance and took advantage of it. He laced a 2-1 pitch into right field for his first high school career hit, scoring teammate James Mitten from third with the winning run in Lookout Valley’s 6-5 tussle with Arts & Sciences. 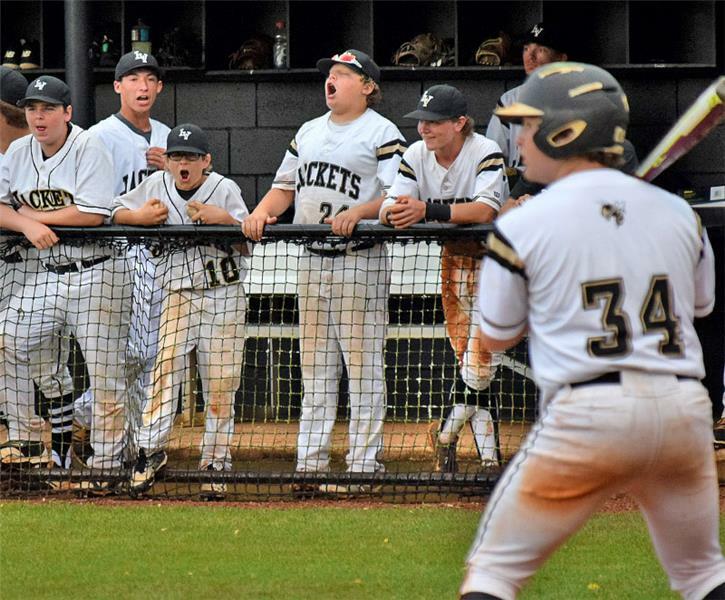 The win brought home the Jackets’ first region crown since it ended a string of three straight titles back in 2009 and sends LV to a state quarterfinal sectional on Friday. LV (26-8) will host University High (21-10) with a trip to the Spring Fling Class A state championships on the line. CSAS (14-16-1) will travel to defending state runner-up Greenback (28-8) in the reciprocating state sectional. Hart got the start with a starter sidelined and didn’t find out about it until he saw the lineup card with his name on it. “Yeah, I was pretty nervous I’m not going to lie. But I had my teammates coming up to me in the dugout before the game and all of them were encouraging me and telling me I had it, so that helped a lot. In that situation, I just wanted to make contact with it and get him home, and it just happened to find a hole. In a game like this, one of this magnitude, to get my first hit was pretty special,” Hart said. Through the first four innings, it didn’t seem like heroics would be called upon for the night by any Jacket hitter. CSAS took an early lead on an unearned run in the first, but pitched balls leaving Patriot pitchers’ hands found the going rough when it came to the strike zone. Three different CSAS hurlers were used to get through three innings and of the 83 pitches thrown only 32 of them were strikes. 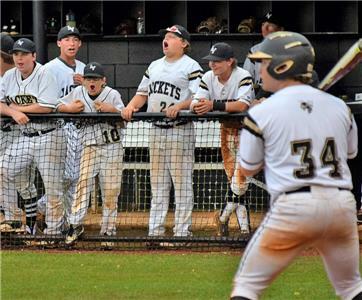 The Jackets waited out eight bases on balls and capitalized on it in a five-run second inning when five free passes, a Zane Howard RBI-single, two wild pitches and a pair of Patriot errors did the damage. The 5-1 lead looked like it was pretty safe with Josh Ibach on the mound pounding the strike zone like he was mad at it and Howard doing his Ozzie Smith impression at shortstop. CSAS, however, is used to battling back as this season has shown. CSAS went through the first two weeks of the season with just one win to show for it, dropping seven of its first eight games and getting a tie another against a really strong early-season schedule. “We had a rough start, but I knew we were okay because of the way we competed during that stretch. We purposely front loaded our schedule with bigger schools who we don’t usually play to get us ready for this time of the year. I wasn’t surprised at all that we were able to get back in this game because we’ve competing hard all year long against some good competition,” CSAS coach Mark Bracher said. The Patriots strung together three hits in the fourth inning to make it a 4-2 affair. Keith Alston drove in the run with single, but Ibach was able to record two of his seven strikeouts to leave two runners stranded. In the fifth, though, Ibach encountered trouble again when back-to-back two-out walks preceded a Parker Lee infield single and a booming double by Alson. Lee’s ball up the middle was snagged on a great diving play by Howard, but with no one to flip to at second for the force, he rushed his throw and it got away to score the first run. Alston’s double plated the second run and when the throw to the plate was mishandled it allowed another in and the game was suddenly tied. The Jackets, however, never seemed to break a sweat or show any signs of letting it slip away. Mitten worked a walk, one of a dozen free passes on the night, and was promptly sacrificed over to second on a bunt. A wild pitch moved him to third which unfortunately had been the kiss of death for most of the night for LV. The Jackets stranded 11 men on base and eight of them were left in scoring position. Hart had other plans this time around, though, ripping a hard opposite field shot to plate what turned out to be the winning run. “We had a speaker at school today come talk to us about staying in the present. Just like in life, adversity is going to rear its head and you have to man up and make something happen. This team really is like a family to each other. They have one another’s backs, so even when they got momentum, it didn’t faze them,” Rorex admitted. It might have been the present, but Rorex didn’t mind pointing out a little bit of the past in his praise for the squad. “This team won 13 games last year and not many people expected a district and a region title and now we have both and we’re one game away from the state. These kids have changed the culture at the school and I just can’t say enough about them,” Rorex added. Last year’s squad actually lost 16 straight games at one point, which made the accomplishment even more special for a senior like Ibach. “We wanted to set the tone early which I thought we did. When we got ahead I think maybe we relaxed a little bit and then all of a sudden it got real again. After we got the lead back, I knew I had to go back out there and shove it again. From last year and those 13 wins to this is really a testament to how close we are as a squad,” said Ibach, who scattered seven hits in the complete-game effort. He retired six of the last seven hitters, working around CSAS big stick Alex Payne in the seventh to do it. Payne stroked his third hit of the game with two outs, but Ibach was able to retire the final hitter on a lazy pop up to right field. “Ibach was a warrior out there. I told him he was going to have give me a reason to come get him, and he said I wouldn’t have to, and then he backed it up,” said Rorex. LV had five hits on the night and CSAS’ final reliever Linden Alford did a great job over the final three innings, but the damage had been done. The five were scattered among five players, but Gavin Slaven, Christian Sexton and Hart each reached base three times with a hit and two walks each. Payne was 3-for-3 with an intentional walk and twice stole second, while Alston was 2-for-3 with the two RBI. Mercedes, Alston (2), Hibbs (3), Alford (4) and Lee; Ibach and Slaven.